The volcanic ash that accumulated on the ocean floor during submarine volcanic activity later turned into tuff. This rock is the “Izu stone”, a prized material used for erecting the stone walls of Edo Castle in Tokyo. Muroiwado is an abandoned quarry that was used to cut Izu Stone. 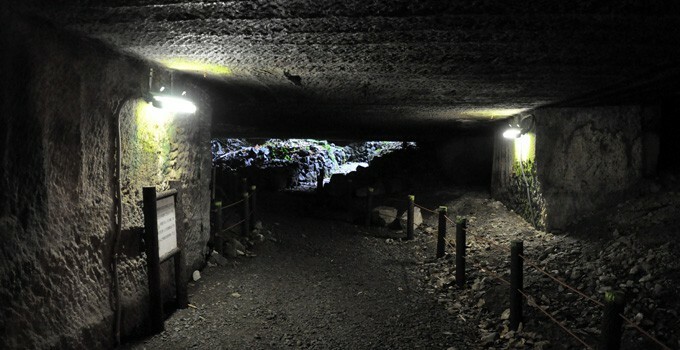 The site is now maintained for tourists, who can have a thrilling experience of walking through the tunnels and look at the interesting rocks. You can reach the quarry by taking the Tokai bus bound for Dogashima from Izukyu-Shimoda station of the Izu Kyuko Line (50 minutes), get down at Matsuzaki and then take a taxi (10 minutes). The parking is free, but capacity is limited to a few standard-sized cars. Parking for microbuses is also available.